Steve Brown visits Lower Moss Wood nature reserve in Cheshire to meet the volunteers and is shown the specialist hospital unit. Winter is a tough time for wildlife, but at Lower Moss Wood nature reserve in Cheshire they pull out all the stops to help. Steve Brown meets the volunteers and the inspirational head of the reserve Ray Jackson, who was awarded an MBE for his services to wildlife. Steve is shown the specialist hospital unit where volunteers are busy tending to some poorly hedgehogs. Ray also helps injured bats build up their strength ahead of release in the spring. Steve gets to meet some of the reserve's permanent residents, including foxes tame enough to feed by hand and the owls who wouldn't survive in the wild. Adam Henson launches this year's search for Countryfile's farming hero. Steve spends the day at Lower Moss Wood Educational Nature Reserve, near Knutsford in Cheshire, with warden Ray Jackson MBE and his team of volunteers. The hospital cares for 2,000 injured and sick animals every year and has become Ray's life’s work. Steve hears that Ray left school at 15 years old and spent 14 years working at a locomotive works before discovering Lower Moss Wood. And that was it. Ray had found his calling. He now lives on the site and spends every waking hour tending to the wildlife here. Matt is in Cambridgeshire with a team creating the biggest wetland of its kind in Europe to bring back one of our rarest birds: the bittern. At Ouse Fen, the RSPB and Hanson are halfway through a 30-year project to create an enormous inland wetland which will include Britain’s biggest reed bed. The wetland is being developed in order to provide a habitat for threatened species like the bittern. And Matt gets chest deep in water to help the RSPB wardens as they get to work on some fish refuges constructed of willow. In recent years, our native water voles have been one of the many casualties of our changing countryside management practices. The water vole has been so affected that it has earned the title of “Britain’s fastest declining mammal” - but efforts are underway to buck that trend. Teams of conservationists and ecologists are working together at sites across the country to rear and re-introduce water voles into better managed wetland systems. Ellie is in Somerset to meet some furry friends - before releasing them into their new home. Firefighters get called out to all sorts of emergencies in the countryside and occasionally they have to cope with animals in trouble. Adam joins Black Watch from the Gloucestershire Fire Service on one of their special training exercises. Adam knows all too well that fires can be a problem on farms – after witnessing a burning tractor in a neighbour’s field. But firefighters do much more than just tackle blazes. Adam finds out about training where they learn to handle a whole range of animals including bulls, horses and sheep. Anita visits Anglesey to meet red squirrel whisperer, David Lacey. The squirrels appear at his window, step inside and even take a walnut or two from his hand - and he’s agreed to show Anita how it’s done…but will she have the magic touch? Anita then joins Holly at Plas Newydd National Trust estate, as she checks her squirrel camera traps. She explains how Anglesey has so far remained free of devastating squirrel pox. There are dozens of permanent animal residents at Lower Moss Wood which cannot be released back into the wild. They’re cared for by Ray and his dedicated team of volunteers. First up, Steve meets one of Ray’s longest serving volunteers, Val, and together they feed the resident foxes. 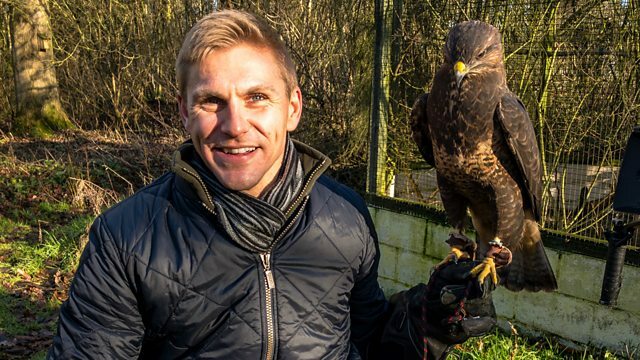 He then goes on to meet Ian and the birds of prey he takes care of. Here, Steve learns how looking after the birds hasn’t just been a hobby for Ian but a lifeline for this former serviceman too.